Foreign investment in Shanxi was rising steadily. There were altogether 85 newly approved foreign invested projects in 2005, among which there were 35 joint investment projects, 21 cooperative projects, 28 projects fully invested by foreigners and 1 project with foreign owned stock. The total foreign investment in Shanxi was US$2.44 billion, among which the foreign investment in the form of a contract was US$1.1 billion, and the actual use of foreign investment was US$0.28 billion. By the end of 2005, the total number of approved projects with foreign investment in Shanxi was 2,056, and the gross investment was US$12.878 billion. Under the impetus of the Expo Fair last year, the investment efforts of the province continue to increase and the investment form as well as the area of investment continue to expand. Last year, the province’s newly approved 62 foreign-funded enterprises, an increase of 19.2%, comprised a total investment of $ 2.92 billion, an increase of 120.9%, contracted foreign capital of $ 1.56 billion, an increase of 55.2 %, and foreign investment in place of $ 2.07 billion, an increase of 37.3%. Shanxi Province is located in the middle of China in the middle reaches of the Yellow River and to the west of Taihang Mountains. 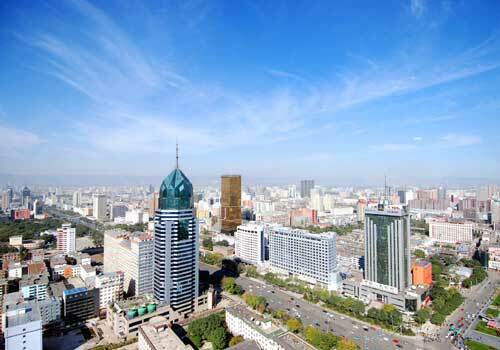 It has 11 main cities, 119 counties or districts and the capital city is Taiyuan City. These cities are rich in natural resources used in production and give foreign companies access to all reaches of China. Shanxi Province possesses abundant mineral resources. There are 120 kinds of ascertained minerals throughout the province. Four traditional pillar industries, coal, electricity, metallurgy and coke, have formed in Shanxi due to its rich resources. Shanxi has therefore become an important resource base in China. The roads that have been opened to traffic in Shanxi Province have reached 66,000 kilometers, with highways making up about 1,686 kilometers. The length of railways has reached 2,512 kilo meters and it only takes three hours to get to Beijing from Taiyuan by train. Additionally, there are more than 40 air routes from the Taiyuan Airport, which is a first-rate port and the region has three other airports in operations: Changzhi Airport, Yuncheng Airport and Datong Airport. The network of fixed and mobile communication has reached nearly all the urban and rural areas in the province. Telephone companies have established their services in 85% of the province and internet & broadband companies have reached 65%. In addition, the province’s international direct dialing can reach 260 countries and regions. Shanxi has 21 financial organizations, including Bank of China and Industrial and Commercial Bank of China. Most of these financial institutions provide international settlement services, international finance services and cross-border banking services. Shanxi is one of the birthplaces of the Chinese nation with a long history and culture. An old Chinese saying goes “Look at Shanxi and you can find thousands of years of civilization”. Many beautiful legends such as “sky-patching by the Goddess”,“ flood control by Da Yu” and“ mountain movement by Yu Gong” all took place in Shanxi. Wutai Mountain ranks first among the four famous Buddhism mountains. The Datong Yungang Grottoes and the ancient city of Pingyao have been listed in the “World Cultural Heritage Directory”. The wooden tower in Ying County is the tallest and oldest wooden structure in the world. The natural reservation areas such as Heng Mountain, the ancient garden in Jin Temple, Guan Di Temple in Yuncheng, Pangquan Channel, Luya Mountain, Li Mountain and Mang River, offer unique natural, historical and cultural landscape with a variety of scenic views. With the influx of tourism in recent years, businesses see an opportunity to broaden their market size in the province by targeting both locals and tourists. There are 23 development zones above provincial level. Relying on local leading industries, superior energy resources, advantageous technology and markets, these development zones have hatched a batch of major industries, including the pharmaceutical industry, the new material industry, the machine-manufacturing and electronic industry, and many others. In recent years, the development zones in Shanxi have been devoted to promotion of conformity with WTO international practices and the certification of ISO1400 international management system to create a facilitating environment for all kinds of investors.